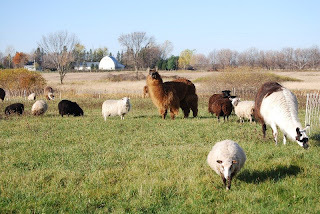 Roundabout Acres: It is GREAT to have green grass in October! I moved the flock out to a portion of our "hayfield." We were able to get one cutting this year. It is such a joy to watch the animals when they move to fresh pasture. The llamas start humming in anticipation as they watch me set up fence. They get the sheep going and that's when the baa's start to get insistent. When I let them in, they all romp in the new grass. We feel fortunate to still have grass for them! And finally, this picture is of Nessarose in the background and Karma in the foreground. Rudy, our gelding has his head in the grass in the back. 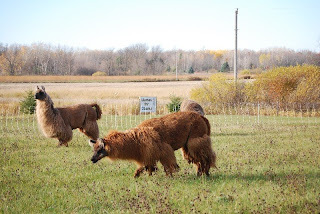 I call these two girls my "fancy-pants" llamas. They do think they are something special. 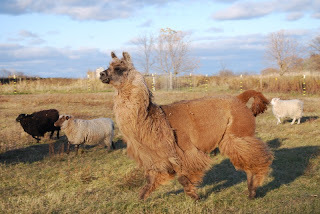 Stay tuned for more pictures of our sheep, including our Shetland Mules and our Cheviots.